Welcome to Bible 805 and this special podcast in honor of the Halloween season. Please understand, there is no irreverence or shock value intended with this question. It was an honestly asked question from someone who was totally unfamiliar with church and we’ll answer it today. 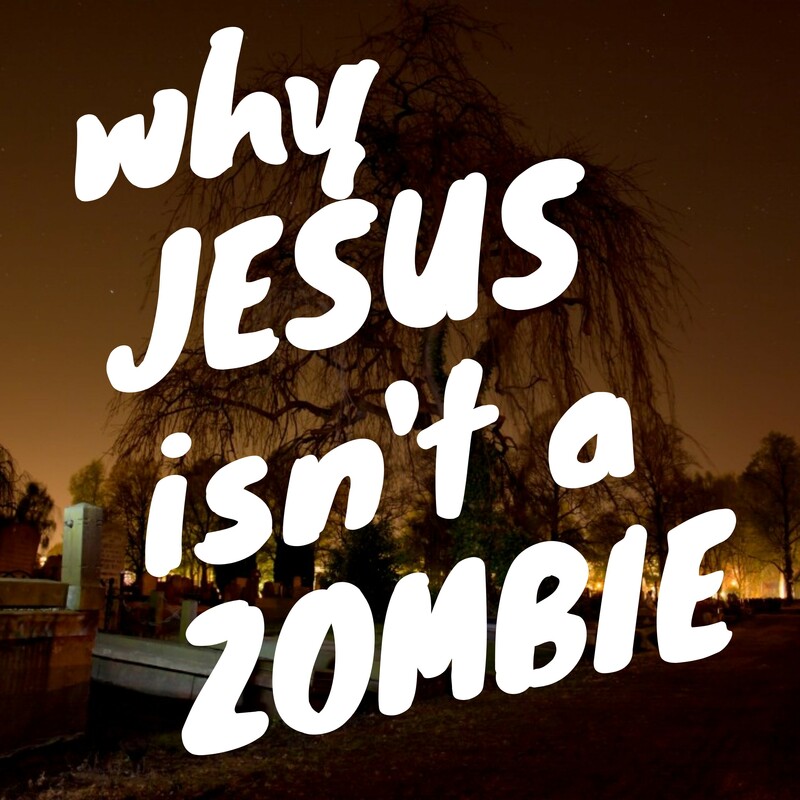 When you think about it calmly, with the viewpoint of someone outside the church,”Was Jesus a Zombie?” really is a very good question because the only conception many people have today of a person who has come back from the dead is a zombie. So when someone hears Jesus came back from the dead, that’s immediately what they think about. To honor that question, this podcast will explore an answer. 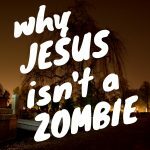 Was Jesus a zombie? Welcome to Bible805 and this special podcast in honor of the Halloween season. Please understand, there is no irreverence or shock value intended with this question. It was an honestly asked question from someone who was totally unfamiliar with church and we’ll answer it today. When you think about it calmly, with the viewpoint of someone outside the church, it really is a very good question because the only conception many people have today of a person who has come back from the dead is a zombie. So when someone hears Jesus came back from the dead, that’s immediately what they think about. To honor that question, let’s look for an answer. How can we find out if Jesus is or isn’t? How can we find out anything about him? The historical record in the Bible and contemporary writers of what Jesus was like when he came back from dead. What the people who know him now say he’s like. The historical record of Jesus after his resurrection and based on that—what we can share with joy is that No!, Jesus was not a zombie—that all we know of him after his resurrection was that he was totally, completely and astoundingly ALIVE. Alive with a power and love we can’t imagine. No half-rotting, stumbling corpse, but alive flesh and blood that burst from the tomb. He didn’t try to terrify his followers or rebuke them for deserting him and leaving him to die a horrible death alone; he went after them, forgave them, answered fears and doubts and cooked them breakfast on the beach. After he rose from the dead, he taught them for 40 days, as he had for the past three years and when it came time for him to leave he honored them with the charge to continue the work he started so that anyone who trusts him as forgiver of their sins and who sincerely wants to follow him could enter the forever LIFE he offered to share with them. Even later, the visions the Apostle John saw of the resurrected Jesus in heaven are even more extraordinary, blinding light, rainbows, visions of angels and Jesus himself: king, warrior, intercessor, lion and lamb—the one who holds the keys of life and death and is alive forever. Here is another amazing thing about Jesus for us now. A zombie is the most imaginative afterlife humanity can conceive of on its own. Rotting, walking corruption—animated, but hardly alive a scary creature—one we run from. That’s so true, but not in a scary, track you down, eat your brain zombie kind of way. If you want to meet Jesus, if you want the life he wants to share with you – just introduce yourself to him. Ask him in prayer to show you who he really is and how to have a relationship with him. Read the Bible—the book of Mark is a quick, easy read and will tell you about Jesus. Get a modern translation like the Message or the Living Bible so you don’t get tripped up by the language. The more you read the Bible, the more you’ll learn about Him. I have another podcast, BIBLE 805 that will tell you lots more about it. Visit a church—one of the best ways to get to know someone is by getting to know their friends. That’s what a church is—a group of people getting to know Jesus. To sum it up. Jesus isn’t a half-dead zombie. He’s ALIVE. If you don’t know him, he wants a forever relationship with you. Please, make it so Lord Jesus.